In 2006 and 2007, I founded and directed La Boca Theatre Company to devise ensemble performances of real stories from marginalised contexts. As a response to the crisis of Hurricane Katrina, La Boca created Evangeline, voicing the ongoing issue of exile in America. 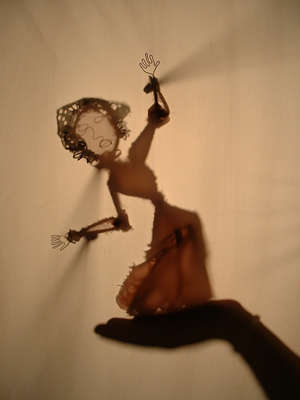 Shadow puppets depicted the legacy of Acadian Diaspora from Nova Scotia to Louisiana (1755), while performers retold verbatim stories of survivors displaced by Hurricane Katrina (2005). La Boca began work on our second piece, Los Diablos, with a residency in Venezuela researching the afro-carribbean festival ‘Los Diablos Danzantes’. We developed a collective piece based on the folk stories surrounding this performance ritual, incorporating the Diablos’ traditional masks, costumes, and choreography, as well as creating representations of the devils in our own lives. Finally, we took to the stage in New York, inspired by ‘Los Diablos Danzantes’ of Venezuela to dance as devils, face our fears, and so doing purge our (international) community of evil.